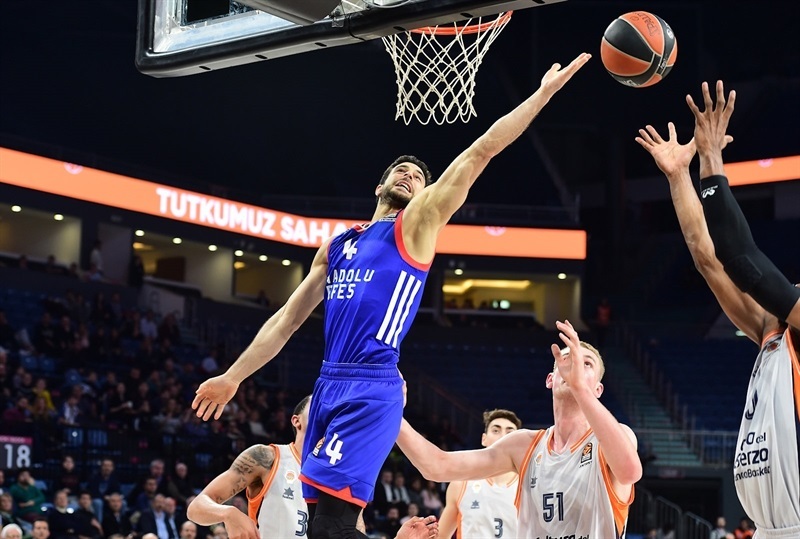 Anadolu Efes Istanbul put an end to its three-game losing streak by downing Valencia Basket 82-66 at home on Thursday. 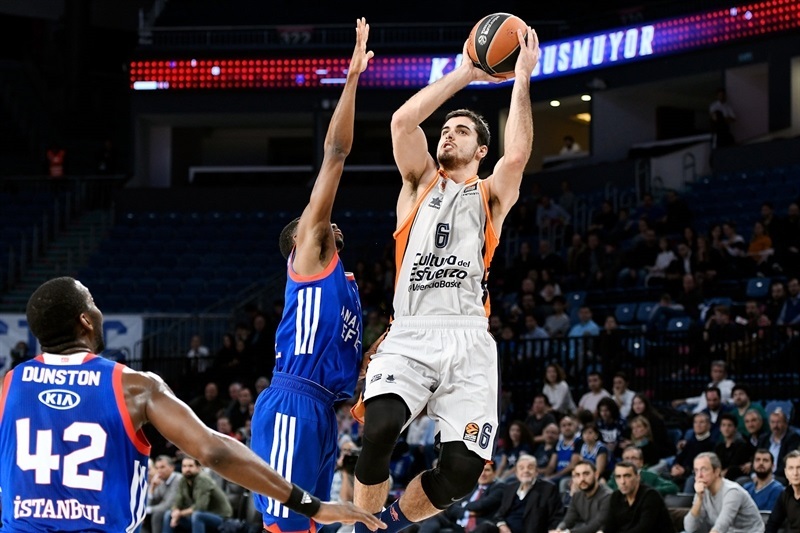 Efes improved to 6-15, while Valencia dropped to 7-14. 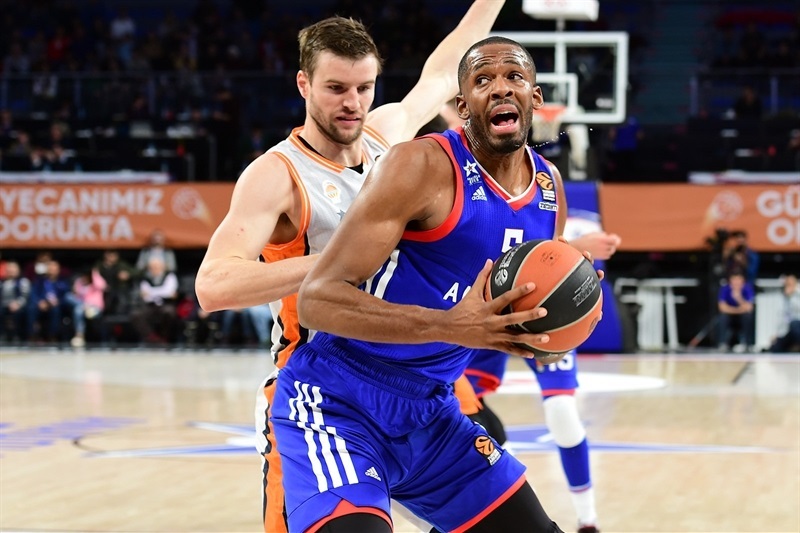 Errick McCollum led the winners with 24 points, 6 rebounds and 6 assists, Zoran Dragic added 18 points, Brock Motum had 11 and Bryant Dunston 10 for Efes. 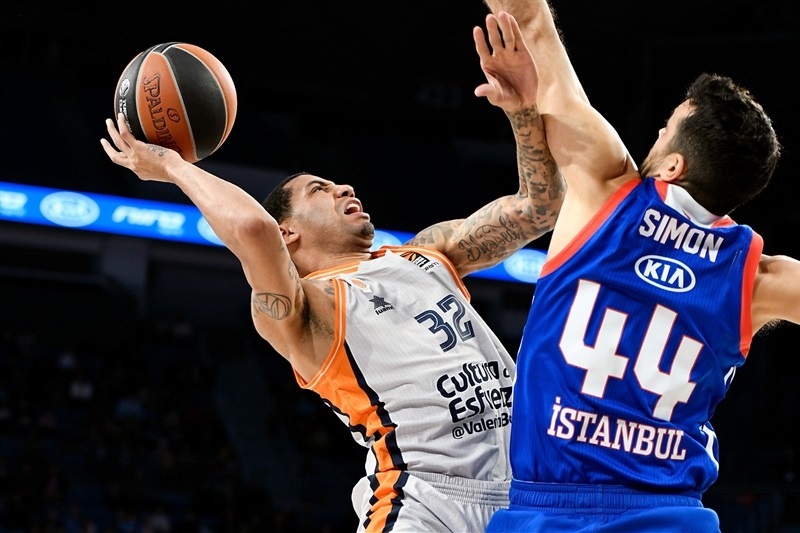 Erick Green paced Valencia with 18 points and Tibor Pleiss scored 10. The visitors travelled without seven injured players, including all four point guards. 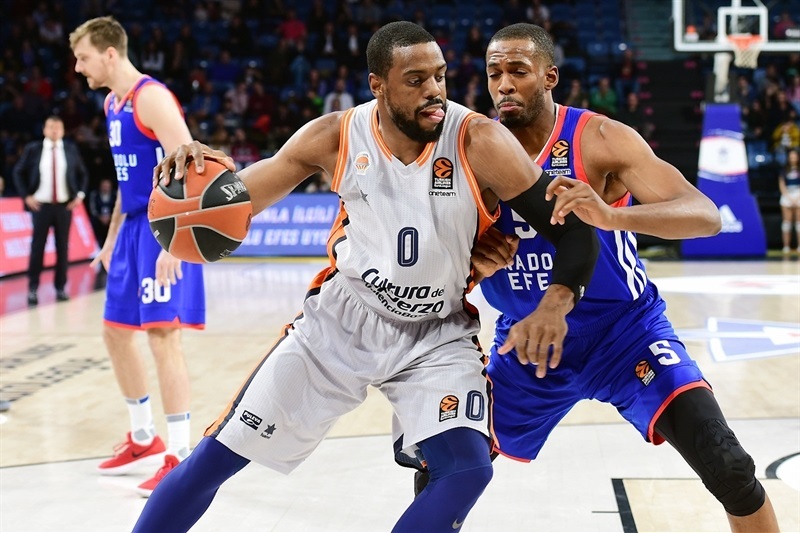 McCollum had 10 points in the first quarter and getting help from Dragic and Derrick Brown to give Efes a 23-19 after 10 minutes. The hosts improved their defense late in the first half and an unstoppable Motum pushed the Efes lead to double digits, 43-31, at halftime. McCollum took over after the break and a dunk by Dunston gave the hosts a 59-40 margin. 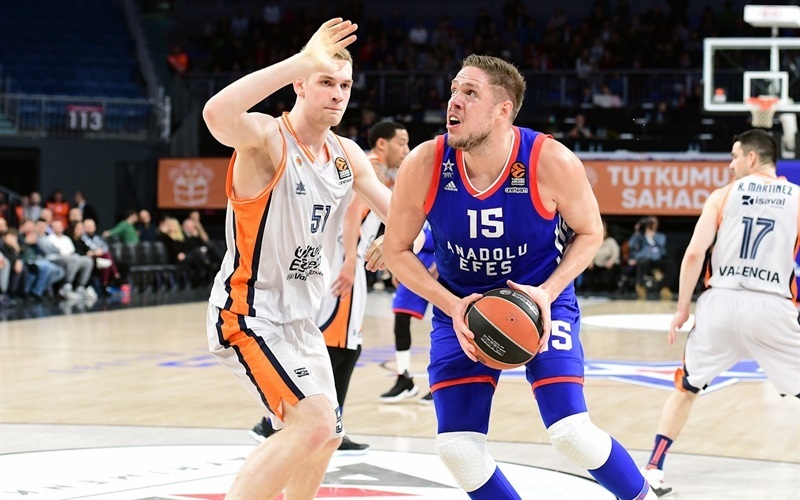 Aaron Doornekamp and Green rallied Valencia to 63-58 early in the fourth quarter, but McCollum, Dunston and Brown took over in crunch time to lead Efes to its sixth win. Brown got Efes going with a jumper and three-pointers by McCollum and Dragic soon gave the hosts an 8-3 lead. Pleiss stepped up with a jump hook, but a layup by Dunston and another triple by McCollum boosted Efes's lead to 13-5. Rafa Martinez and Pleiss fueled a 0-7 run, which Will Thomas capped with a layup. Dragic followed a tip-in with a driving layup and McCollum added a couple of jumpers, but Alberto Abalde and Green brought Valencia within 23-19 after 10 minutes. 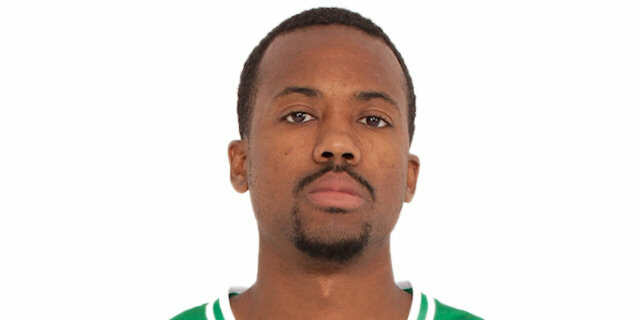 Brown scored down low early in the second quarter and a three-pointer by Krunoslav Simon gave Efes a 28-19 margin. Rafa Martinez and Josep Puerto tried to change things for Valencia, but Toney Douglas and Vladimir Stimac kept Efes way ahead, 32-23. 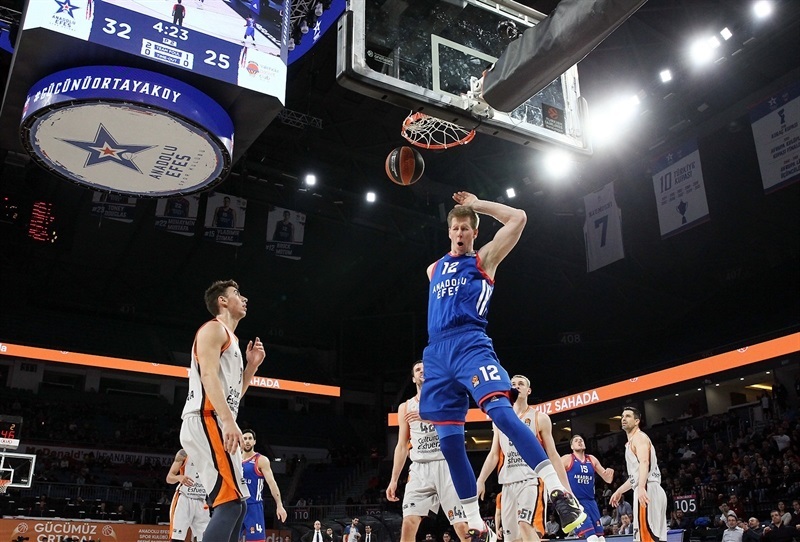 Efes found a new go-to guy in Motum, who dunked twice and added a layup and a three-pointer to make it a 15-point game. 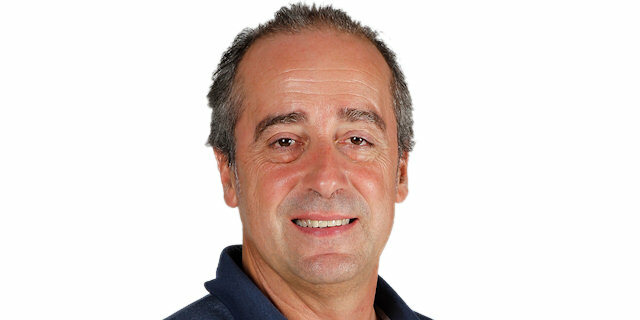 Puerto and Joan Sastre brought Valencia a bit closer, 43-31, at halftime. Doornekamp struck from downtown right after the break, but McCollum followed a jumper with a dunk for a 48-36 Efes lead. Pleiss took over with a dunk, a jump hook and a layup, but Dragic and Dunston caused the guests to call timeout at 55-40. A layup by Brown and a dunk by Dunston gave Efes its biggest lead, 59-40. Doornekamp hit a three-pointer and Green added two more plus a four-point play to bring Valencia back to life at 63-53 after 30 minutes. 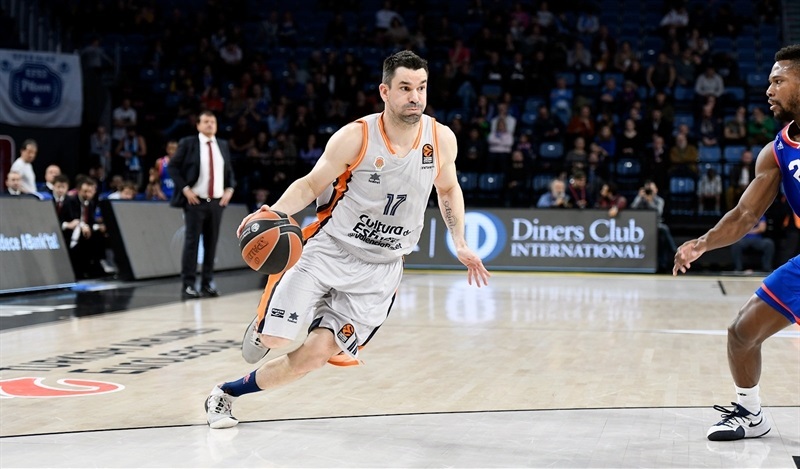 Abalde scored down low and Green hit one from beyond the arc to make it a 5-point game, however McCollum rescued Efes with 5 points in a 7-0 run for a 70-58 lead. 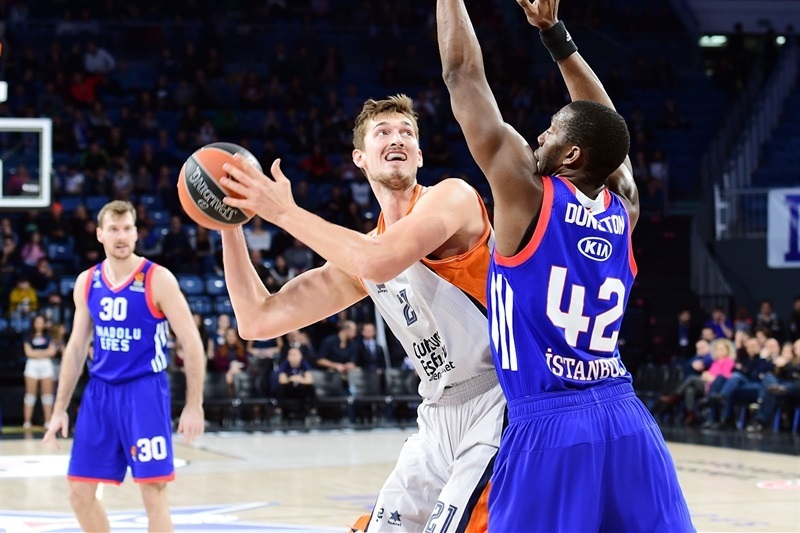 Motum and Brown helped Efes put the game away at 74-60 with two minutes remaining. 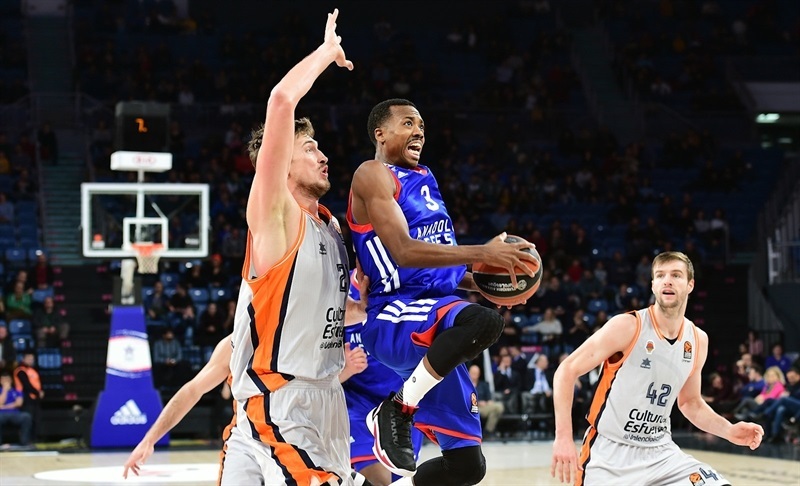 Valencia did not give up, but Efes did not find much trouble to seal the outcome. "I think we played good basketball. We started the game with aggressivity on defense and offense, high tempo, we shared the ball very well and had a very good shot selection. In the beginning of the game, we had the control of the game. We improved our defense in the third quarter and started to find fast break points. On offense, we moved the ball well, inside and outside, shared the ball and got a big advantage, a 19-point advantage. Then in the last part of the third quarter, for a couple of minutes, we lost concentration on fast break defense and let open shots to Erick Green - he made three or four, I think, three-point shots in a row and they came back to the game. After that, we played our regular basketball and won an important game for us. 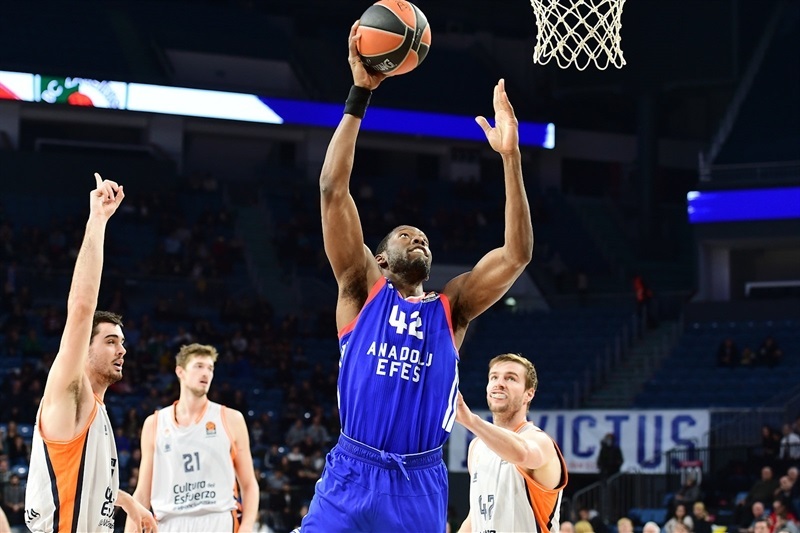 It will be difficult for us to reach the playoffs range, but we want to play good basketball and these kinds of games are good for Anadolu Efes's prestige in Europe." 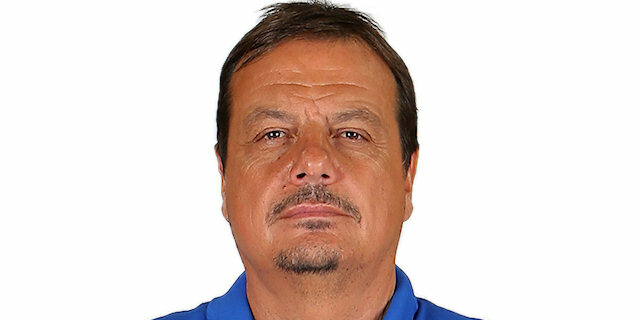 "Congratulations to Anadolu Efes for this important win. During the first quarter, we played bad defense from the three-point line. We received three open shots in a row, but during the second part of this first quarter, we made a good job and stayed alive in the game. During the second quarter, we had great problems to attack Efes's very good defense, but at the end of the third quarter and especially in the beginning of the fourth, we did a good job, with good percentages, changing defense and running. We were only 5 points down with five minutes to go, but had a turnover and an unsportsmanlike foul right after that, McCollum scored 7 points, Dragic hit a three-point shot and the game was finished. For us, it was a very difficult game. We have seven players out and are without point guards, but we tried to compete, as always. We did it during 37 minutes and only in the last three, the game was killed by Efes." "I think I came in focused early and I think the other guys did as well. My teammates did a great job setting screens - Bryant Dunston, Vladimir Stimac got me open. Guys just hit shots and made plays. It was a great team effort. We are defending better; we had been losing games early and right now, we are playing good basketball. We are playing better in the Turkish League and in the EuroLeague. It is better late than never; we have to continue like this and see what can happen. It could be an interesting season."